Ducati's 950cc adventure weapon gets major changes. Ducati have been hard at work on their whole Multistrada line-up. 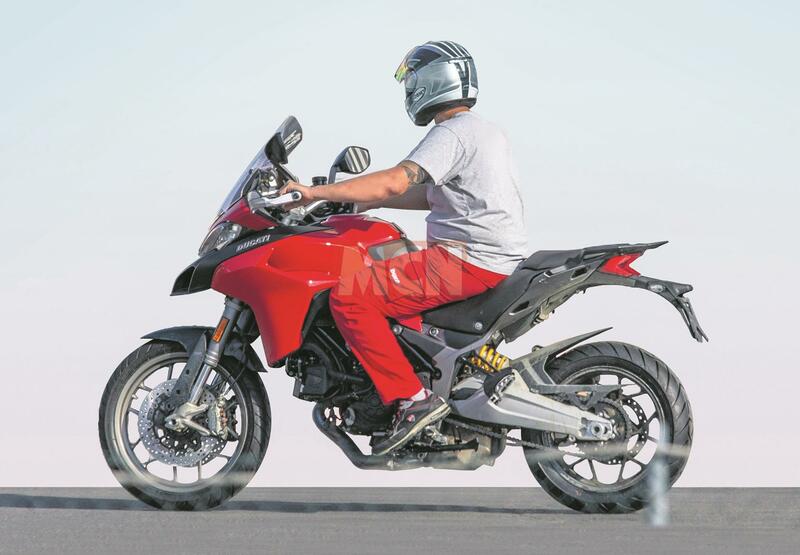 As well as the new Ducati Multistrada 1260 Enduro, new spy pics suggest there’s also an update to the 950, which should make it slicker and quicker than ever. The most obvious change is the upper fairing, which now matches the one on the latest 1260 Multistrada. There are other aesthetic changes, such as the colour of the swingarm, but most of the updates are on the inside. Externally the engine looks very similar, however it’s now got a hydraulic clutch rather than the old cable-operated item; a switch Ducati recently made on the Scramblers. We also expect the engine to be the updated lump due to feature in the new Hypermotard, so it is likely ready for the Euro5 emissions when they arrive in January 2020. Power should be up 5-10%, so a meaty 120bhp is possible. As part of Ducati's safety roadmap, we expect the 950 to come with Cornering ABS as standard. As that's IMU-based, Ducati could add lean-sensitive traction control too. The 950 already has riding modes, but we expect these to be updated and it’s possible there will be a bi-directional quickshifter too. Still no sign of a 950 Enduro to match the 1260, which is a shame as it has great off-road potential. Cornering ABS and updated traction control will be the cornerstone of a new safety package. A new clutch is one of the biggest changes to the 950, which has been updated for Euro 5 rules. The remote preload adjuster has moved, which could be down to a larger change to the suspension. The 950 is over £11,000 so with the new electronics it could push the price to £12,000. Ducati could unveil the bike at the EICMA show on November 4. See MCN’s New Bike Special in the November 7 issue, for full details on all the new metal.